This entry was posted in Economy, Media, Politics. Bookmark the permalink. 28 Responses to EMMA ALBERICI. There’s no case for a corporate tax cut when one in five of Australia’s top companies don’t pay it. Excellent article by Emma. By Turnbull’s and Morrison’s reactions you can tell they really don’t like their junk economics, trickle down theory, Laffer curve hocus pocus, getting exposed for what it is – lies and damn lies in support of their corporate masters interests. It would be no different if Labor was in office (not in actual power of course – just in office). Corporate interests have bought both sides of politics to do their bidding, we all know this. All the bully boy politicians like Turnbull and Morrison can do is kick and threaten the ABC, tell the ABC to pull the article and in true Thought Police, fascist style try and damage Emma’s credibility and career by unjustly claiming the work is poorly researched, left wing socialist rubbish, without providing a shred of legitimate contrary evidence, all just typical puff and bluster. Of course it seems Emma has used really left wing propaganda sources ,NOT, like the OECD, CBO, IMF etc (lol), to provide her evidence, actually some of the most economically orthodox, right-wing institutions on the planet. Other commentators, including Bearnard Keane and Michael Keating have provided excellent well reasoned support for Albirici’s findings. I could add further evidence, it’s everywhere, but it’s hardly needed, the situation is clear enough. On other aspects of this subject I find the term “trickle down” to be highly offensive, even if it did actually work, even though it never has and never will. To accept trickle down is to accept that the vast majority, the 90%+, will only ever get a trickle, a small bone thrown from capital’s table if and when it pleases. That’s not acceptable in any semblance of an industrialised democracy, even if it has ever been thus. And, of course, what has actually been happening throughout the neoliberal era of the past 40-or so years is that income and even moreso wealth, has been gushing upwards to the 1% and particularly the 0.1% and is now reaching the hitherto unprecedented levels of inequality of the Belle Epoque. It hasn’t been trickling down. And it seems to Mr Turnbull et al that the way out of this situation is to give even more and more to the rich. I think it was Einstein who famously defined madness as doing the same thing over and over while expecting different results. But Turnbull isn’t stupid. He knows it won’t trickle down,he knows it will go to him and his rich fat rentier class and business mate benefactors. Remember, Labor has already agreed to allow the tax cuts to flow through to small and medium size enterprises. So, it’s really largesse for the top end of town where the argument now rests. 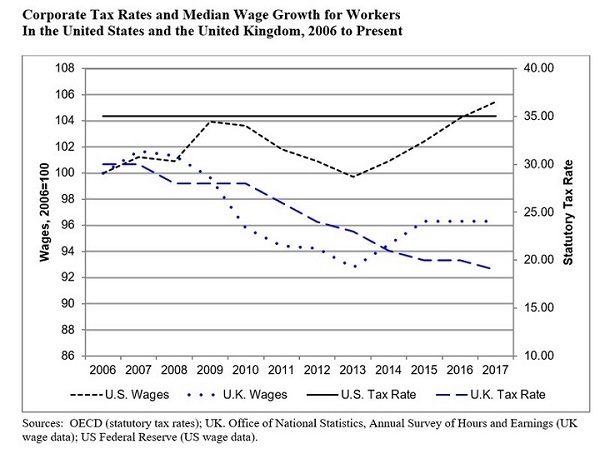 Why is it that the only way to increase wages is apparently through by some fairytale, long winded transmission mechanism – corporate tax cuts will improve bottom lines, thereby freeing up funds for possible investment and thus possible more labour demand and thus possible higher wages. There are many heroic theoretical assumptions in all this. Reality doesn’t give a toss about theory. And as others have pointed out there are many other things that such a tax cut windfall could be spent on other than wage rises. In aggregate corporate profits rose around 20% last year alone. Many large corporations are already sitting on mountains of cash and liquidity, so why not provide a wage rise directly right now while bottom lines of many corporations are already so healthy? 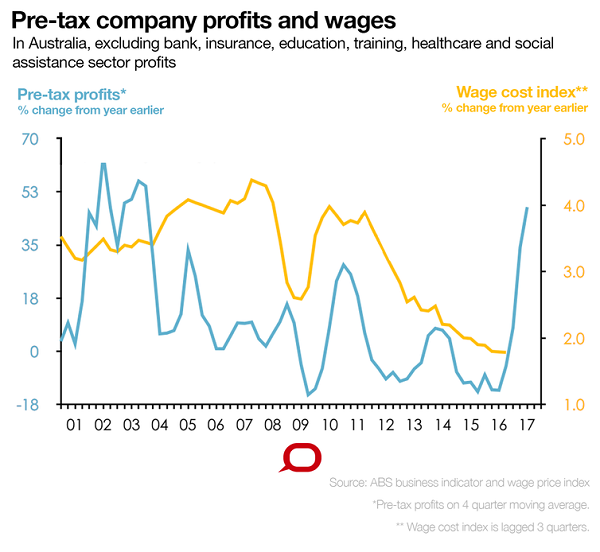 The argument for real wage rises used to be all about productivity, but trends for many years show wages stagnating or barely rising while productivity gains continue to rise, consequently resulting in a rise in the profit share and a gap opening up between productivity snd real wages. So surely there must be some scope to absorb some wage increases without risking a wage price inflation blowout, particularly as most unions have been beaten to a pulp. But no,Turnbull and his economics brain trust seem hell bent on throwing tens of billions more of taxpayers money at the top end of town as if it’s the only option and then HOPE the good plutocrats at the top just maybe, might throw a crumb off the table for the working masses to chew on. But that might make the next quarterly result a tiny bit weaker than it could otherwise be, so don’t hold your breath waiting for that crumb if you’re a wage earner. My guess is that the bosses are much more likely to trouser any tax cut, after all they have needs and wants too, Sydney city real estate and Ferraris are not cheap! On the apparently uncompetitive, investment killing 30% corporate tax rate, it’s interesting that the global behemoth, Amazon is actually just entering the Australian market despite the obviously onerous 30% corporate tax rate. Amazon isn’t stupid, it knows it will pay nothing like 30%, but Morrison et al will continue to talk Australia down saying how uncompetitive we are at 30%, even though he must know the effective rate is less than half that, and last year over 700 of the largest companies in Australia actually paid ZERO corporate tax! I will guess that Amazon will likely be on that ZERO tax list for sometime. Nevertheless, it’s very un-Australian for Mr Morrison to talk Australia down the way he does. It’s a wonder he didn’t scare Amazon off altogether. Another point well made by Emma and others is that through our almost unique dividend inputation system, a great deal of the effective tax gain from the proposed tax will go to overseas shareholders anyway, without similarly benefiting Australian shareholders. That would be another very un-Australian outcome don’t you think Mr Morrison? Here’s a couple of policy suggestions to increase wages and hence aggregate demand and economic growth prospects without throwing billions in tax cuts to large corporations, 1. Simply increase wages right now with retained corporate income even if that means temporarily reducing a quarterly dividend payment to shareholders. Somehow we just have to break the moronic, cost cutting, labour shedding, asset stripping, quarterly focus of CEOs.. And 2. If the government is concerned about real spending capacity, how about personal income tax cuts for lower and middle to upper middle classes instead of corporate tax cuts – if genuinely concerned about low effective consumer demand this would be a more direct and effective way to increase demand and growth without directly increasing labor costs for firms. Of course, that would also punch another hole in the fiscal deficit, but apparently when we talk about tax cuts we don’t have to consider such things. In fact, I think I heard Scott Morrison recently say in an interview that personal income taxes will come and they will come “first”. If it was Scott and if it is true, I feel possible political trickery and chicanery could be on the horizon. Here’s a possibility – attempts to win voters over to corporate tax cuts could be made by crassly linking personal income tax cuts to a proviso also accepting corporate tax cuts. Of course such a policy move would also do all sorts of not so wonderful things to the debt and deficit bottom lines, but apparently such matters as debt and deficit only count when we are talking about the expenditure side of the budget, particularly on things like health and education and social security. Debt and deficit and AAA credit ratings seemingly don’t matter when we are talking about TAX CUTS! Everyone loves tax cuts, whether they are affordable, responsible or not. On the expenditure side Defence and Security and Surveillance expenditure seem to be the exceptions. Always necessary, always affordable, and never any need to talk about the opportunity cost of things like submarines and fighter jets – to raise such questions would be unpatriotic. As mentioned earlier the real reason the government (any government) will continue to push hard for corporate tax cuts to the big end of town is because corporate interests have paid them to do a job for them, and that is to put more money in their pockets, and to hell with the impact on the broader community. A politician’s job is to sell the people what business wants, not what they or their communities might want. The reward for good subservient politicians is cushy executive positions, board memberships, and consultancies with the big end of town when they inevitably leave political life. It is not about serving the interests of their constituents. being rammed down the Australian public’s throat, and now apparently an existential threat and urrgent necessity simply because Trump has cut corporate tax rates in The US (to be implemented over many years). If we have to follow what everyone else is doing, particularly the Americans, then why aren’t we abandoning our single payer (government) health system called Medicare, because the Americans don’t have that system. Would Malcolm Turnbull like to do that? He seemed particularly peeved about such a suggesttion during the last federal election campaign. And why are we continually raising private costs on tertiary education when Germany and other countries are moving towards, or have implemented, free tertiary tuition. Is our Government even aware that there is a place on earth called Scandinavia? If so, perhaps it might like to look at the policies of governments within Scandinavia and note the quality of life and economic outcomes achieved there. I will conclude my contribution by again thanking Emma for her timely, well researched and accurate analysis. And shame on the ABC for buckling again to the ideological thugs in tbe Government. I can’t miss this opportunity to rewrite a wonderful quote from the piece on tbe ABC News on February 14, 2018, where Alberici apparently depicted Goldman Sachs as: .”…the great vampire squid wrapped around the face of humanity, relentlessly jamming its blood funnel into anything that smells of money…..” I can understand why the Government would be outraged by this, particularly Mr Turnbull, as the vampire squid in question was one of his previous employers. Perhaps some may see him as the squid now wrapping his tentacles around the hopes and aspirations of many Australians. I don’t think that there can be anything more damning than the censorship of an article that is not in your or your associates interests. congratulations on a well-researched and logically presented article re the relevance of the proposed and much trumpeted Government corporate tax cut. The promised transparency and consultation with the people that this government had heralded in 2016 seem to have been conveniently lost in the fog of “the national interest” and accelerated use of “double speak” George Orwell must be grinning from ear to ear! Please keep up this incredibly important role that you and the ABC have in trying to keep the people of Australia informed with the Facts. It is only with accurate informed public opinion that we can possibly hope to sing with confidence ” Advance Australia FAIR”! Our National Anthem needs to be THE spring board for our values and the governance. The ATO released figures stating in 2015, 576 companies made $410 billion and paid no company tax. In 2016 ,732 companies made over $500 billion and paid no tax. So there was an increase in the numbers of companies ,an increase in the money they made and no company tax paid. It is a totally false argument that reducing company tax will increase the wages of PAYG workers.The above figures cannot be denied. How often is valid research suppressed because it is inconvenient or contradictory for some person with the authority or prestige to effect the suppression. I refer to the doctoral thesis on the suppression of valid research by the talented Dr Jacqui Hoepner. I suggest that persons doing research or comments thereon should include their pertinent professional qualifications and any qualifications or restrictions perceived to the views they have expressed. While the PM is entitled to show his dismay at the content of Emma’s article, it was a Trumpian act of suppression to request its removal. Furthermore, the ABC’s obsequious compliance indicates the extent to which it is in the thrall of the present government. The Government should not have got involved in this article and by doing so just goes to show how they are trying to destroy the ABC and it’s excellent staff. I agree Ken – the government are using their power inappropriately and ABC management shouldn’t buckle to pressure. Emma Alberici delivers well researched facts to back what we already know – this government do not understand what Australia or Australians need. Dismal stuff from the government and the government is not to believed as to its whining about this, given the lies it has told concerning Barnaby Joyce and many other issues and its subjective attitude toward social infrastructure spending. It follows the old IPA tactic of presenting hearsay as fact and people like Alberici and Eslake should not be browbeaten for questioning its self serving lines. If black is black, it should be presented as black by any broadsheet journalist until such time as those it questions present empirical facts to back their cases. The claim that the Emperor wears no clothes should not be answered with a loud “shush” but examined on its merits when likely impacting so much on many people’s lives. Logic, as a school subject, possibly incompatible with the ‘trickle down’ rubbish that have been foisted onto the general public, I have not seen as school curriculum in 35 years. Perhaps this goes against the idea that education is for job preparation, and paying back HECS, something Malcolm didn’t have to worry about. So, imagine my surprise, at my first TAFE Human Rights class. I asked the teacher if we could talk about politics. She said, “We MUST talk about politics.” She asked the class what was the phenomena affecting the world today? I put up my hand and said, “Neo-liberalism?” That was her favourite subject. Wow! I had only learnt what ‘neo-liberalism’ meant a couple of weeks earlier. Basically it’s where profits [for a few], are given priority over the well-being of everyone else in the community. Few people seem to have heard of it, yet it pervades our lives. It has crept up so slowly over the decades that people are conned into it. Hospitals, libraries and parks do not have ‘feasibility’ studies, yet these [by the NSW Government] have recently been used in Lismore Greens meetings to OK the destruction of our railway. As it is, we have no equitable way of accessing our environment, amenities, friends and family, across the region, or our closest large city – Brisbane – if we cannot or prefer not drive through an increasing high fatality on the roads here. It doesn’t matter which party we vote for – they are all tainted with neo-liberalism, and mathematically, there’s no way of democracy in the state’s [northern] regions without a state secession. Maintenance of rail trails, that a wealthier elite, can use without a fee, are sure to be payed by increasing rates here, where in Queensland, it’s the taxpayer who pays for theirs. GST was the first step to getting the poor to pay more tax. Petrol sales are another way. Greens in the Northern Rivers, who are supporting rail trails, are also supporting a real increase in carbon emissions, by not supporting no/low carbon emitting, and safe public transport. Rail trail supporters are using the ‘trickle down’ effect in their campaign, but they have no facts or figures to show this to the public, but Tweed Chamber of Commerce, and the majority of Tweed Shire Council have fallen for these tactics. How ripping out Newcastle CBD’s most direct express line to Sydney can be accepted as ‘Revitalising, or, opening the Newcastle CBD to the foreshore,’ is beyond comprehension. That Emma is employed by the ABC and her position as Economics Correspondent ought by right to have her view/commentary on the Publicly Funded ABC! You have to wonder what has come of the once fair and free Australia?? How can so many at the time of an election really and truly could judge or think that under these utter nutter right wing nut jobs that they will be better off??! Illustrated in the current context by the muted furore around the total Hypocrite Joyce B!!! As for the other Joyce how can he possibly have any sort of contribution to an overall economic discussion? After all Qantas, and the dirty diggers business’ appear to be among the largest recipients of upward welfare ever seen! If the ABC continue to indulge in censorship of this or any other kind – maybe the withholding of Public Funding is the way to go?? Great article, well researched, clearly argued and well presented. Difficult to understand why this was ‘removed’ by ABC management. It would appear to have all the hallmarks of an independent broadcaster doing what it should do…. Investigating and reporting on matters of public interest. This will always include analysis of the current government’s policies and actions (as well as actions of other political parties and groups). This will also inevitably lead to sitting governments being irritated, angry or upset by the ABC at certain times. It goes with the territory and with the ABC’s charter. So it is highly disturbing that the current ABC management has intervened in the situation, apparently in response to criticisms made by members of the sitting government. Hard not to see this as bullying by the PM and others, and a very disturbing compliance to direct political pressure by ABC management- both of which seriously undermine the independence of our ABC and contravene its Charter. All my professional life my practice was based on evidence. The evidence base for trickle-down economics, introduced by Thatcher/Reagan, is non-existent; forty years of the haves gaining obscene wealth and the have-nots suffering the consequences. The ABC is in dire straits, succumbing to censureship imposed by an increasingly authoritarian government; the second time in a month. Superb work Emma! We NEED you more than ever to keep exposing the REAL FACTS to the public due to so much cover-up and manipulation in most media circles at present. Along with Michael West (ex Fairfax media/SMH) you two are ESSENTIAL to getting the truth out there, but how do we enable more exposure for investigative journalism? Well, when they cut Emma Alberici’s Lateline and Stan Grant’s The Link last October we all thought ‘oh yeah just in time for the By elections huh’ and they proudly boasted ‘Lateline host Emma Alberici will take up the new position of chief economics correspondent when the show finishes. ..’ and gee look how that works for her and us…. Congrats to P & I for posting this excellent article which did indeed appear first on the #ABC website but has apparently now been taken down. I have been using Twitter – where there’s much discussion about censorship and possible political pressure on the ABC – to make sure at least some people know where this article remains available. Yet another reason why thoughtful blogs, such as this one, will play an increasingly vital role in public conversations that affect us all. I first read this excellent article in the ABC website, where, by rights, it should still be found. As if you needed another reason to hate the Coalition. A very informative piece. I wondered at the information regarding Alan Joyce’s pay rate? How can anyone spend/use $100,000 per day? There is not, anywhere, that I have seen that indicates he is a raving philanthropist. Simply a self-centred little Irish immigrant. And as to companies paying tax? When I was a company (part) owner, our very good accountant made sure that our piddling little company paid no tax. A brilliant analysis that pulls the cover from a corrupt government. Turnbull’s censorship vouches for its quality ! PS if businesses want employees to have higher wages why did they fight to reduce penalty rates? Great article Emma! The psychology of markets is to not pass on lower costs if there is no pressure to do so – not to customers and certainly not to employees. So where is the pressure? Competition? Bah humbug! Four banks, three supermarkets, an electricity oligopoly… yeah, sure that’s going to happen. The only thing missing from the governments narrative is – “Once upon a time…” and “they all lived happily ever after”. Excellent article Emma. Keep this good information flowing. Having read Emma’s piece and then Judith Sloan’s reply I can’t quite see where Emma misrepresented the issue of companies not paying tax. Am I just a slave to confirmation bias? I don’t really know the basis for CEO pay/bonus system but, interestingly CEOs pays don’t seem to follow the same rules as the tax loss/profit. It would seem that as soon as a company makes a profit CEO pay goes up. I agree with Emma, the spin is not backed by much evidence. Michael Parenti points out in his talks that giving tax cuts to profitable companies in the HOPE it will lead to jobs and prosperity for the wider population is illogical and is basically fortune telling. May as well ask Gypsy Rose Lee. Even without the economic theory that disproves tax cuts for the rich grows an economy (M. Blyth and Emma), how can policy makers claim to predict how this windfall will be spent? The board members can do what they want: pay themselves more, or add a few more million to the CEO’s stash, give bigger dividends to shareholders, redecorate their offices in gold leaf, move it offshore or buy overseas cheap labour, pay for academics to produce studies supporting their interests, buy up real estate and inflate the bubble more, or pay more lobbyists to “donate” to political parties. The list is endless. Or they could spend it putting their right wing representatives into office to demolish democracy. Why would they necessarily volunteer to pay workers more or expand business in America or Australia? Did they ever agree to do that if they got tax cuts? It also assists the well advanced Libertarian agenda. Perhaps the real agenda is to trickle up, to further reduce governments’ ability to spend on health, education, and welfare services in the attempt to reduce government interference and further privatise public services. Oh and what a fiasco privatisation has turned out in Newcastle’s, “better” bus system. Cohen said it all with a catchy tune in “Everybody Knows”. A good clear read with facts and not IPA theory and fantasy. In some cases, taxation treaties allow a non-resident investor that incurs an Australian withholding tax liability to claim a foreign income tax offset in their country of residence. In such cases, the non-resident’s effective tax rate on Australian dividends/interest income is their personal tax rate in their country of residence. In these circumstances, a cut in the Australian company tax rate (and thus the rate of withholding tax levied on unfranked dividend payments by Australian-listed companies) would have the effect of reducing revenue collected by the Australian Government; from the non-resident investors’ perspective, the rate of return (net of taxes and credits) on Australian capital would however remain unchanged. Effectively, in these circumstances a cut in the Australian company tax rate is a transfer from Australian Government revenue, to foreign Government revenue. In conclusion, this preliminary modelling-based investigation of the impact of a cut in company tax finds it to be a policy that stimulates output but dampens growth in gross national income. To me, a policy which is not needed, for the reasons Emma outlines above concerning the low effective rate given our regime of corporate deductions, which diverts revenue from the Australian government to foreign governments with whom we have “double tax” treaties, and which actually reduces Gross National Income over what it otherwise would be, is very unwise – indeed almost insane! Bad policy must be called out! Excellent piece Emma! Thank you for the analysis and confirming in my mind that the Wealth Tax Cut will not trickle down to the average Australian worker in wage growth or in any discernible way. Why give a huge tax cut to Corporations who are enjoying higher than ever profits and are able to minimise their tax down to zero = $0.00. Just seems very wrong to me.